A Media Matters study of engagement on Facebook pages that regularly post about American political news over a 37-week period found that right-leaning pages had nearly identical engagement as left-leaning pages. This study produced similar findings as a previous Media Matters study of political engagement on Facebook over an earlier six-month period. Right-leaning and left-leaning pages on average earned roughly the same number of interactions per week. Throughout our 37-week study, right-leaning pages earned on average about 372,000 weekly interactions and left-leaning pages earned on average about 369,000 weekly interactions. Partisan pages earned more interactions than pages without political alignment every week of this study, earning on average only about 283,000 weekly interactions. Right-leaning and left-leaning pages had the same engagement relative to page size. Right-leaning and left-leaning pages had the overall same interaction rate (a metric measuring the performance of a page relative to the number of page likes), at .17 percent. Pages without political alignment had an overall interaction rate of .07 percent. The findings of this study are consistent with a previous Media Matters study of Facebook engagement. In a study published in 2018, Media Matters reviewed engagement on Facebook pages that regularly post about American political news between January 1, 2018, and July 1, 2018, and found that partisan pages had roughly equal engagement. This new study, reviewing engagement on Facebook pages that regularly post about American political news between July 2, 2018, and March 17, 2019, found similar engagement numbers for right-leaning, left-leaning, and nonpartisan pages as the previous study. Since our last study, right-wing media figures and Republican leaders have recently rehashed yet another wave of unproven claims that major tech companies and social media platforms are censoring conservatives. In February, right-wing undercover video-maker James O’Keefe published Facebook documents to allege that the site targeted conservative posts for “deboost”-ing. In the following weeks, Donald Trump Jr. authored two op-eds baselessly claiming that he and other conservatives are being censored by tech companies. And even President Donald Trump recently claimed there was “big discrimination” against conservatives on Twitter and Facebook. In July, Media Matters published a study of political content on Facebook between January 1, 2018, and July 1, 2018, which debunked an earlier wave of Facebook censorship allegations from conservatives. The study showed that right-leaning and left-leaning pages had virtually the same engagement numbers based on weekly interactions (reactions, comments, and shares) and interaction rates (a metric calculated by dividing the total number of interactions per post on an individual page by the number of likes the page has). A new Media Matters study of content from 395 Facebook pages that regularly post about American political news between July 2, 2018, and March 17, 2019 (the day Donald Trump Jr.’s second op-ed was published), shows that not only did left-leaning and right-leaning pages still have roughly the same engagement numbers, but -- between January 14 and March 17, the weeks leading up to this new wave of conservative censorship claims -- right-leaning pages on average actually received more interactions than left-leaning pages. Media Matters also found that, over the course of the study, both right-leaning and left-leaning pages outperformed Facebook pages without political alignment in terms of engagement. 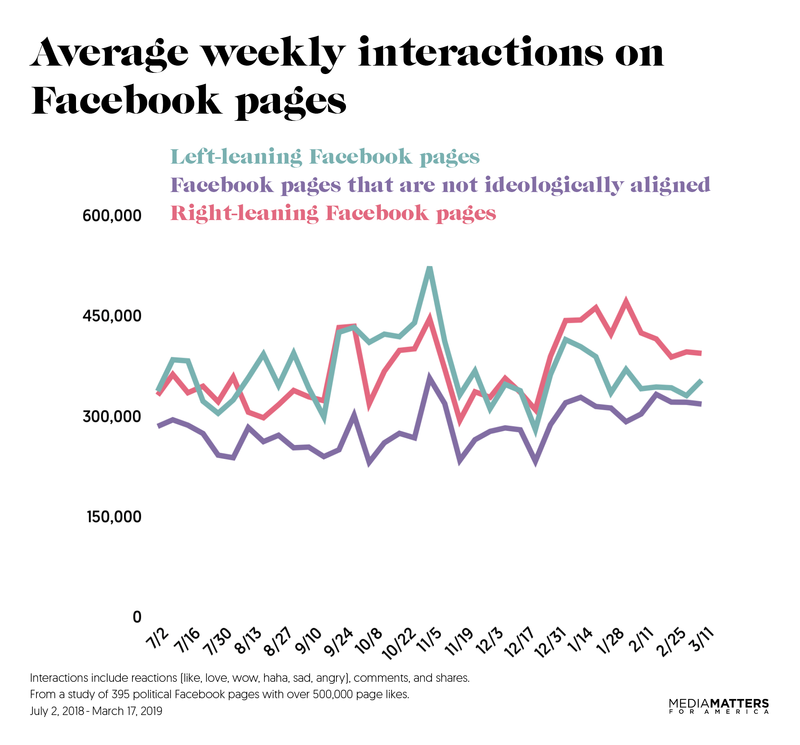 Between July 2, 2018, and March 17, 2019, right-leaning and left-leaning Facebook pages had roughly the same number of weekly interactions. On average, right-leaning pages earned around 372,000 weekly interactions each. Left-leaning pages averaged about 369,000 weekly interactions. Partisan pages earned more average weekly interactions than pages without political alignment every week of this study, with nonaligned pages having on average only about 283,000 weekly interactions. Right-leaning and left-leaning Facebook pages had on average the same interaction rate over the 37-week period. Interaction rates, calculated by dividing the total number of interactions (reactions, comments, and shares) per post on an individual page by the number of page likes, offer a performance metric that is proportional to the size of a page and how frequently a page makes new posts. Left-leaning and right-leaning pages both had an average weekly interaction rate of 0.17 percent. Partisan pages vastly outperformed pages without political alignment, which had an average weekly interaction rate of 0.07 percent. Right-leaning pages averaged higher engagement than left-leaning pages starting three weeks before prominent conservatives renewed cries of bias and continued to do so throughout the period in which they made those claims. 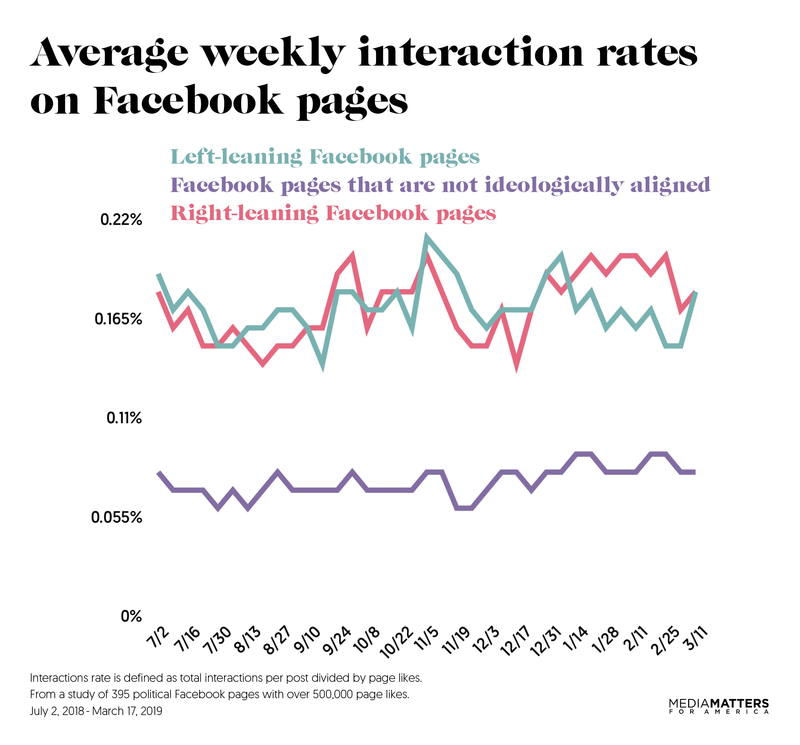 Right-leaning pages on average earned more interactions than left-leaning pages every week from December 24 through March 17. And between January 14 and March 10, when prominent conservatives such as Trump Jr. sparked a new round of cries of bias, right-leaning pages had a greater interaction rate on average than left-leaning pages. In a previous study published in July, Media Matters compiled a list of 463 Facebook pages that pertained to news and media outlets, media figures, politicians, political parties, and issue-focused advocacy groups. Each page in this study: (1) had over 500,000 page likes; (2) regularly posted content related to U.S. political news; and (3) posted at least five times a week every week of our study. In the eight months since our first study was published, 39 of those 463 original pages have been removed from Facebook. An additional 29 pages were excluded from this new study because they did not post at least five times a week every week of this new 37-week period. No new pages were added to this study. The resulting numbers of pages reviewed by political alignment were 395 total: 131 right-leaning pages, 172 nonaligned pages, and 92 left-leaning pages. Pages were coded by two researchers and reconciled by a third researcher for two factors: (1) content related to political news and (2) ideological alignment (left-leaning, right-leaning, nonaligned, or “other”). Each page was individually reviewed and only pages that regularly focused on news about American politics were included in the study. The ideological alignment of a page was determined by a page’s name, information in the “About” section, and posts. Pages that expressed opposition to President Donald Trump or focused on issues primarily aimed at liberals (e.g., protecting abortion rights, calling for action against gun violence, etc.) were coded as left-leaning. Pages which expressed support for Trump or focused on issues primarily aimed at conservatives (e.g., restricting abortion rights, downplaying gun violence, etc.) were coded as right-leaning. All pages for right-wing and left-wing media outlets were automatically coded as right-leaning or left-leaning, respectively. Pages that did not have an ideological leaning in their content were coded as nonaligned. If there was doubt about whether to code a page as nonaligned or left-leaning, the page was coded as left-leaning. Pages were coded as “other” if they did not fit in any of the above categories or if they contained a mix of left-leaning and right-leaning content. Media Matters obtained data on each page’s interactions, interaction rates, postings, and page growth in one-week intervals (Monday-Sunday) over a 37-week period, beginning the week of July 2, 2018, and ending the week of March 11, 2019.